Many parents give an iPhone to their children for logistics and safety reasons. In the pursuit of reaching their children, they are exposing them to many potential distractions and dangers if they give them a smartphone too early. If you are not sure if your child is ready for a smartphone, check out our checklist of questions to answer before you grant the smartphone wish. The good news is that the iPhone isn’t the only option. Although you have to do some digging because the phone companies would much rather sell you a smartphone, there are some great options for basic phones. The first step is determining what network your cell phone carrier is on. GSM (Global System for Mobiles) and CDMA (Code Division Multiple Access) are the two major radio systems used in cell phones. In the United States, AT&T and T-Mobile use GSM and Verizon and US Cellular use CDMA. Before purchasing a flip phone, make sure it is compatible with your carrier's network. There are no apps for the phone beyond those installed by Verizon. 2 MP Rear-facing camera: Data can be turned off from the Sprint App so that MMS messages are disabled and only text messaging is enabled. Internet: This can be turned off in the settings when the phone is purchased so that Internet access is blocked. Talk to a Sprint representative for more information. 2MP rear camera with flash. There is no front camera which means no selfies for your littles. Compatible with GSM carriers, including AT&T and T-Mobile. Also compatible with GSM SIM Kits, including Cricket Wireless, Tracfone, Net10, H2O, AT&T Prepaid and Simple Mobile. The phone will not work with Sprint, Verizon Wireless, Boost Mobile, Virgin Mobile or any other CDMA network. One parent on the AT&T website raved about this phone for his teenager: "This sweet beast of a phone was bought for a teenager who couldn't control his Clash of Clans addiction. No more worrying about that next turn! Its amazing how much of a difference it made in his grades and personality also. He went from a class failing zombie to an actually productive, and might I even add, happier, alert teenager. He now has to have actual conversation with his family instead burying his head into a phone. Who knew a phone downgrade would be a kid upgrade!" Offers a basic way to access the internet but requires a separate data package to connect. Cell phone is compatible with GSM carriers like AT&T and T-Mobile as well as with GSM SIM cards (e.g. H20, Straight Talk, and select prepaid carriers). This company is poised to make a big change in the world of phones for kids. The Relay is set to be released this summer. It is a smart walkie talkie that celebrates adventure and leaves the smartphone behind. The Light Phone 2 is exactly what parents have been looking for in a phone for their kids. With its chic design, it has a "cool factor" beyond any basic phone without all the garbage that comes with a sleek smartphone. The Light Phone 1 was released in 2015 and is capable of talk only. It was intended to be a companion to your smartphone, allowing you to leave the house and enjoy life without distractions. The next generation, the Light Phone 2, expands capabilities of the phone, allowing it to stand alone and is due to start shipping next year. The Light Phone 2 does not have any social media or games. Please consider one of these options instead of a smartphone for your child. Join more than 16,000 parents in delaying the smartphone for their children by taking the Wait Until 8th pledge today. There is strength in numbers! 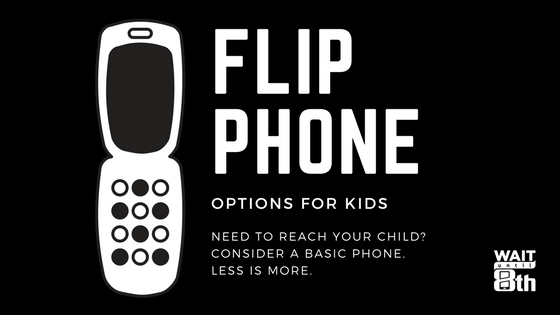 Rally your community to choose the basic phone instead of the smartphone for young children. Childhood is too short to waste on a smartphone. Let's let kids be kids little longer. Katie Mullen lives in Leawood, Kansas with her husband and two children. She is very passionate about delaying smartphones for children. Katie is also a blogger and author of The Happy Mommy Handbook. Older PostIs my child ready for a smartphone?